On 5th July, I had a visit by Blaise and a professor from a university in Finland, who has been visiting the school for a few days. This house was part of his visit. He said that he would not have gone this far without first dynamic thermal modelling. I replied that there are no yardsticks to work with, or comparable examples of such unknown quantities that could be trusted. By going ahead and doing it full size, and collecting real world data, I am in a better position to feed data to the model. I benefit from the reduced bills, and have fun doing it. There are so many variables that any sort of modelling using existing software with existing parameter types is inaccurate to the point of being useless. What commercial software has swimming pool panels or polycarbonate boxes to use as parameter types? Which one has a GSHP driving cold glycol through a Sunbox in the autumn and winter, enabling it to retrieve energy even when the Sun does not shine? How many GSHPs have an array of evacuated tubes feeding them with solar energy through a heat exchanger? Also... I am 64, and cannot wait several years before starting. I want to get on with it, and benefit from the cost savings from reducing the energy consumption of the house. 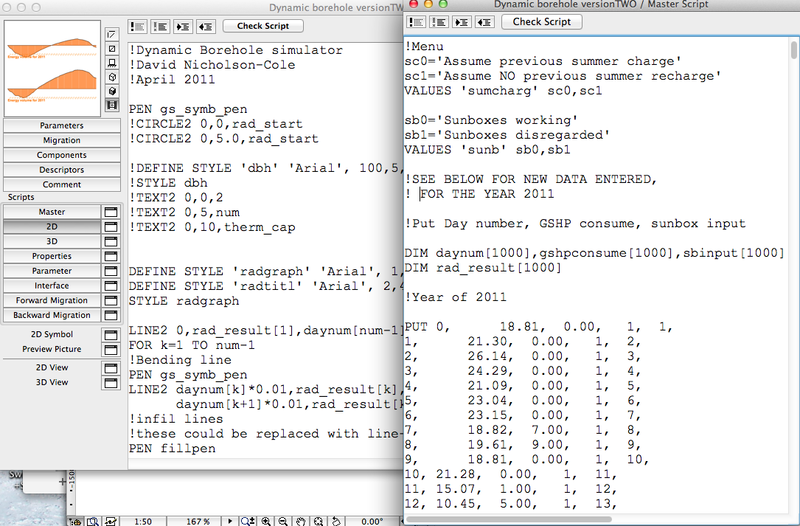 I first attempted some dynamic simulation in April 2011, following a chat with some of our PhD student. However, I made the mistake of going directly for a 3D solution, representing an actual full scale borehole in 3D, changing in size to represent the energy bulb, and changing colour too, and displaying the resulting temperature. This was far too difficult. 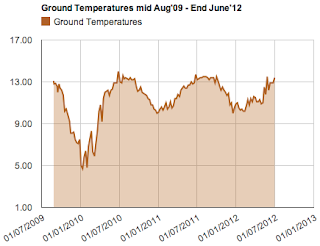 So in July 2012, I started out seeking only to make a 2D graph, similar to my graph of ground temperatures. The curve shape is established through ground temperatures. Fast fall off in autumn to winter, slow climb-out in spring and summer. This is my own dynamic simulation, using REAL metering data collected during the year of 2011, and written using GDL, the software that is a programming language that I have taught and written about. Top: GSHP working without benefit of Sunbox, from 1 Jan-31 Dec 2011. Bottom: Borehole energy level refreshed by Sunbox in the same 2011. This graph is for the year of 2011 from new year to end of year because it is the only clear year without any significant system changes. The problem though is that 2011 has been the warmest year on record with no winter periods, no snow, hardly any rain. 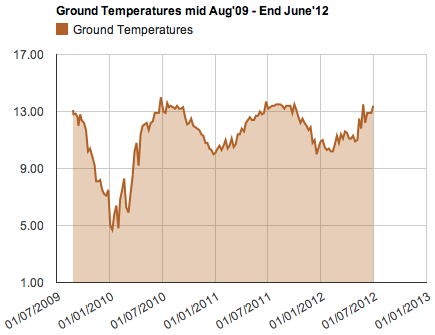 The graph is not showing the ground temperature but the energy level in the ground. The only real feedback I have from the borehole is the weekly ground temperature level, because the real energy level is invisible. Energy level should be thought of as a bulb of soil that has achieved a certain temperature - that has a theoretical thermal mass of several thousand kilowatt hours. As more energy is poured in or drawn out, the temperature does not change drastically, but the bulb of soil at that temperature changes size. 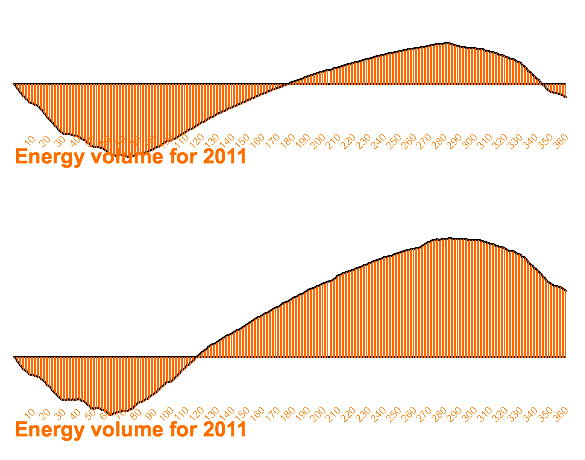 The ground temperature has a characteristic curve shape that one can see emerging from this energy level simulation - a steep fall off in the months of winter, and a long slow climb out during spring and summer. The only way I can simulate this is to quantify the energy taken out and the energy put in, and then apply a Delta-T assumption for the heat being received from the infinite surroundings. Assuming a COP of 3 for the GSHP, I have assumed that the amount taken out of the ground is twice the number of kilowatt hours of electricity burnt by the GSHP. Variables unknown are many, the precise volume of the borehole, how much of the heat energy from the house is drawn from it, and how much the sun box puts down, how quickly the energy level in the borehole is restored from its infinite surrounding. The borehole is not an insulated store. 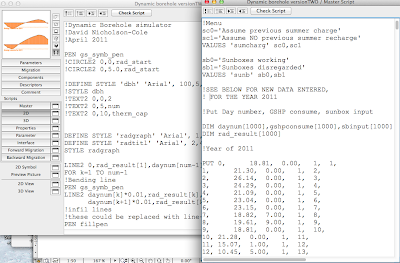 The solar panels have never been calibrated (or yardsticked) in any table of data from CIBSE or similar. What I have assumed for the delta-T suction of energy from the infinite surroundings is that the colder the borehole (in the winter), the faster it will draw heat from outside. Conversely, I have had to assume that if the energy level rises too far, some of that energy will be moved out of reach, or lost due to system losses. The rate at which it does this is proportional to the square of the volume of the bulb (because the area of the circular cross-section is PI*Rad^2). Getting the balance right requires the application of a variable. Because we are talking of squaring thousands of cubic metres of borehole, we are having to divide by millionths. With some practice, the familiar shapes above appear. In the lower diagram, with Sunbox refreshing the borehole, the lowest energy level is reached earlier in March, and does not reach such a low energy level, as the diurnal solar capture is restoring the energy level before the bottom is reached. There is the same long climb out during the summer, but a higher peak is reached. When the heating starts in October, there is the same rapid descent, but at the end of the year, the energy level is higher. The data used here is the list of actual meter readings for the GSHP and the Sunbox. Next task is to widen it to include 2010 and the first half of 2012. More about electrical storage - NiCads!